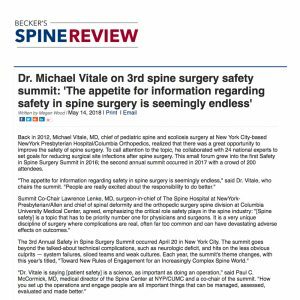 Dr. Michael Vitale on 3rd spine surgery safety summit: "The appetite for information regarding safety in spine surgery is seemingly endless." Back in 2012, Michael Vitale, MD, chief of pediatric spine and scoliosis surgery at New York City-based NewYork Presbyterian Hospital/Columbia Orthopedics, realized that there was a great opportunity to improve the safety of spine surgery. To call attention to the topic, he collaborated with 24 national experts to set goals for reducing surgical site infections after spine surgery. This small forum grew into the first Safety in Spine Surgery Summit in 2016; the second annual summit occurred in 2017 with a crowd of 200 attendees. "The appetite for information regarding safety in spine surgery is seemingly endless," said Dr. Vitale, who chairs the summit. "People are really excited about the responsibility to do better." Summit Co-Chair Lawrence Lenke, MD, surgeon-in-chief of The Spine Hospital at NewYork-Presbyterian/Allen and chief of spinal deformity and the orthopedic surgery spine division at Columbia University Medical Center, agreed, emphasizing the critical role safety plays in the spine industry: "[Spine safety] is a topic that has to be priority number one for physicians and surgeons. It is a very unique discipline of surgery where complications are real, often far too common and can have devastating adverse effects on outcomes." 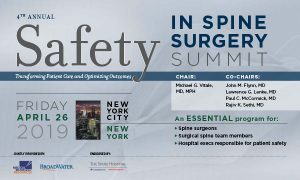 The 3rd Annual Safety in Spine Surgery Summit occurred April 20 in New York City. The summit goes beyond the talked-about technical complications, such as neurologic deficit, and hits on the less obvious culprits — system failures, siloed teams and weak cultures. Each year, the summit's theme changes, with this year's titled, "Toward New Rules of Engagement for an Increasingly Complex Spine World." "Dr. Vitale is saying [patient safety] is a science, as important as doing an operation," said Paul C. McCormick, MD, medical director of the Spine Center at NYP/CUMC and a co-chair of the summit. "How you set up the operations and engage people are all important things that can be managed, assessed, evaluated and made better." Each summit includes a pre-course, where participants focus on a deliverable. This year, the group finalized a best practice guideline for Halo Gravity Traction, a procedure designed to decrease the curvature degree in children with idiopathic scoliosis. Previous efforts have focused on developing best practices for infection, neurological safety and wrong level spine surgery, and are available at www.safetyinspinesurgery.com. This year, 20-plus faculty shared lessons from micro to macro, with discussion focused on how to optimize individuals, teams and the healthcare delivery system as a whole.